⭑ How does it work? Forget breaking out a big mixing bowl (where’d you store that thing anyway?) and a wire whisk (it’s always such a pain to get all the batter off)... Just throw ALL your ingredients into a blender, and blend until uniform! 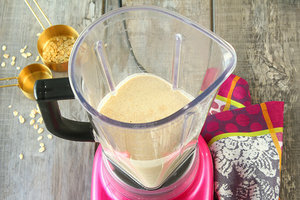 You don't have to worry about a lumpy batter because, well, mixing things thoroughly is what blenders do best! Adding nuts, chocolate chips, or something else you don’t want pulverized? Just remove the blender from its base after whipping up the batter, and stir in your goodies. ⭑ Why does it rock? Let us count the ways! 1. It spares us the tireless wrist ache of stirring and stirring. 2. It saves us from having to wash a mixing bowl, a whisk, and a spoon. 3. The easy-pour spout of the blender means less mess. 4. It allows us to seamlessly infuse our batter with wholesome ingredients like fresh fruit and old-fashioned oats! ⭑ What types of batters can I make in a blender? Stick with thinner batters, like those for pancakes and most muffins. For thicker batters (fudge, brownies, and cake), grab your food processor! ⭑ What am I waiting for? We don’t know... What ARE you waiting for?! Check out these recipes, and get blending! Bonus: Just-Add-Water Mixes Packed with Protein! Batter up! Just so you know, we may receive compensation from some of these links. Help your pals streamline their cooking projects -- click "Send to a Friend" now!